Patti Stories homepage: Building a log cabin. 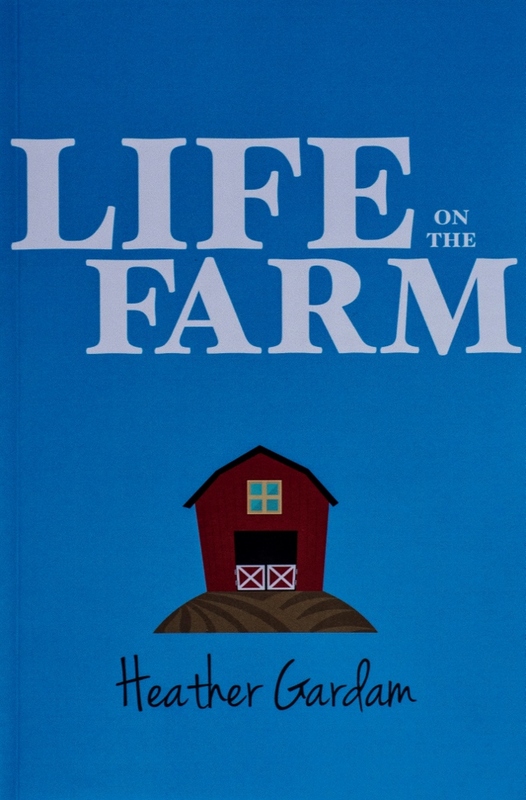 Heather Gardam is the author of the Patti Stories, a set of three books - Life on the Farm, Little Guy and Joan's Summer. 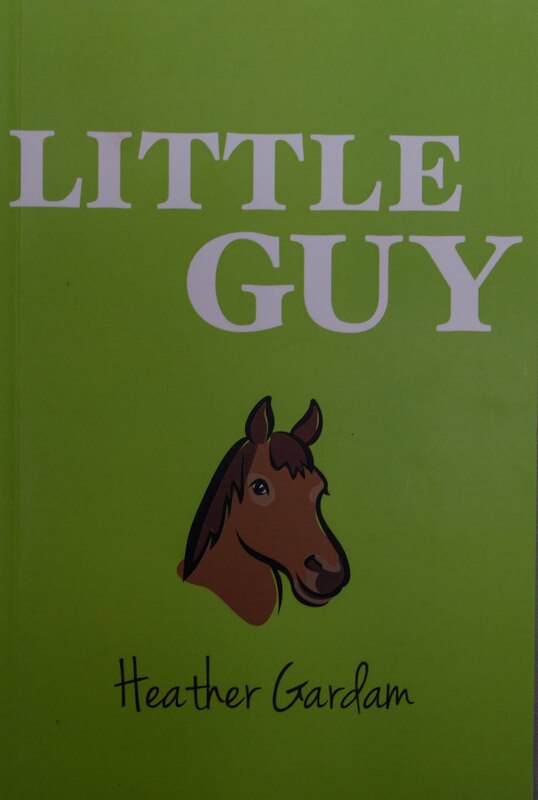 Heather has lived on a Canadian Gulf Island for most of her life, but when she was ten or so she lived on a farm in Southern Ontario and that experience is fictionalized in the Patti Stories. However, many of Patti's experiences are a blend of that setting and of raising her own family of three girls in a rural setting on Saltspring Island. These stories draw on the realities of both places and it is this that gives Heather's writing that extra ring of truth. Heather has been a teacher, a CUSO volunteer in South America, and has sailed the Pacific in a wooden schooner. She has two BA s from the University of Victoria, in English and Psychology and in Creative Writing. She has also published poetry and magazine articles. She is presently writing an adult novel set on the West Coast. 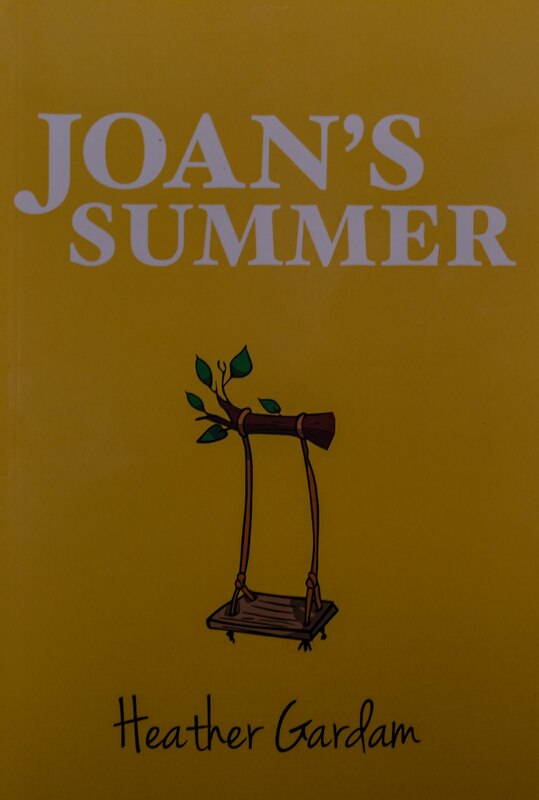 In 'Joan's Summer' the two girls, with help from the Blackburn family, build a log cabin. 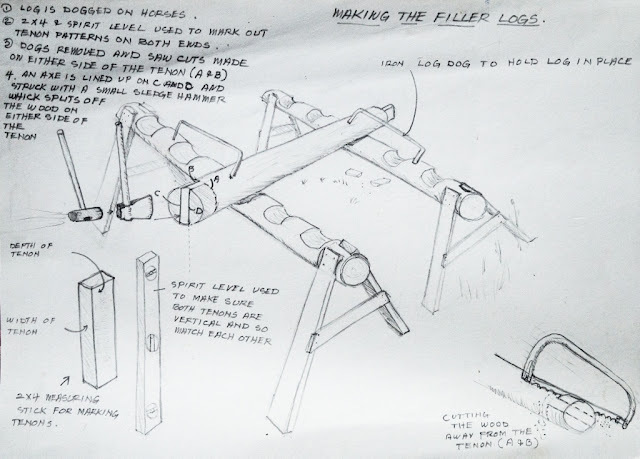 This, for couple of twelve year old girls is a big project, but not impossible, but the building process must seem complicated so here is a simple explanation. When Heather and our family moved to Saltspring Island the first thing we built after the pumphouse and the barn was a piece en piece style log cabin. We had cut our lodgepole pine logs in the Okanagan where we had lived previously and brought them with us. Like Patti and Joan our first job was to clear a building space and make foundations. In our case we poured concrete bases on the uneven rocky ground and then placed cedar posts of different lengths on top and levelled their tops. In the girl's project they used some big rocks they found nearby and levelled them by digging the holes to different depths. We cut down some fir trees and rolled and levered these sill logs into position on the cedar posts. The corners were notched to fit together. With dad's help the girls did much the same. Good foundations that keep the bottom logs off the damp ground means that the cabin will not rot from the bottom up! To work on the walls we really needed to have the cabin floor in place so we could stand on it and work safely. We flattened the inside faces of the sill logs and levelled and then nailed boards to them and then installed the floor joists and the plywood floor. Our cabin was twenty by thirty feet and Joan's cabin was eight by twelve feet ( three sheets of plywood). 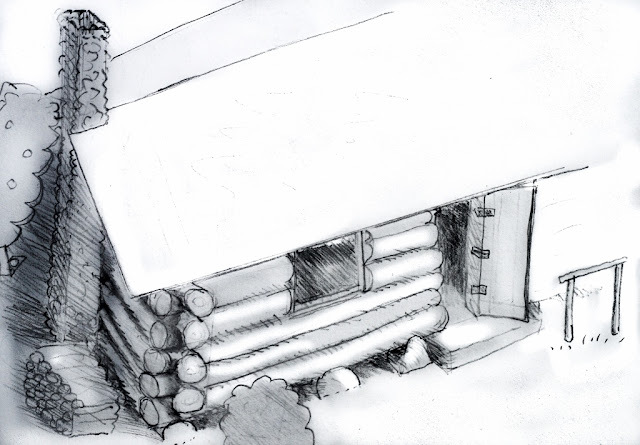 The upright posts had long slots, or mortices cut lengthwise and they were then placed upright on the sill logs, pinned using rebar, and then braced vertically on the corners and along the sides of the cabin. Unlike the usual log cabin which relies on the stacking of horizontal logs to hold up the roof, a piece and piece style is a post and beam structure and the log walls simply fill the space between the posts. One could use a variety of different materials for this - sticks and mud, adobe, rock masonry, cordwood, glass, hay bales, you name it. In our case and in Joan's cabin the walls could be built of already available, small diameter and short-lengthed, easily lifted logs. 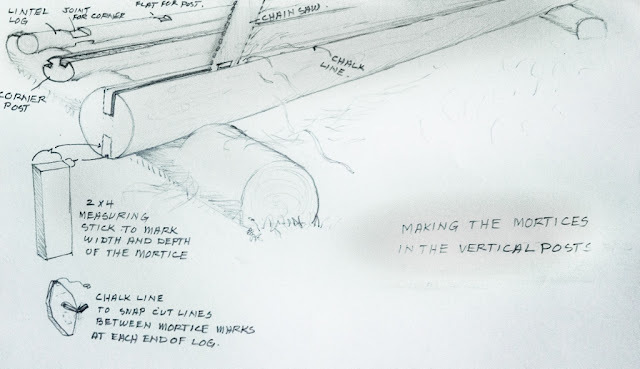 Once the logs had the bark skinned off ( no bugs to eat the wood under the bark if they are skinned) they were cut to length and the ends cut into a tenon ( or tongue) that would slide down the mortice ( or groove) in the upright posts. All this cutting could be done in an assembly line sort of way using simple tools, - a saw, a carpenters square, a level and an axe. In our cabin we also scribe-fitted each log to fit the shape of the one below and placed a strip of insulation between them. 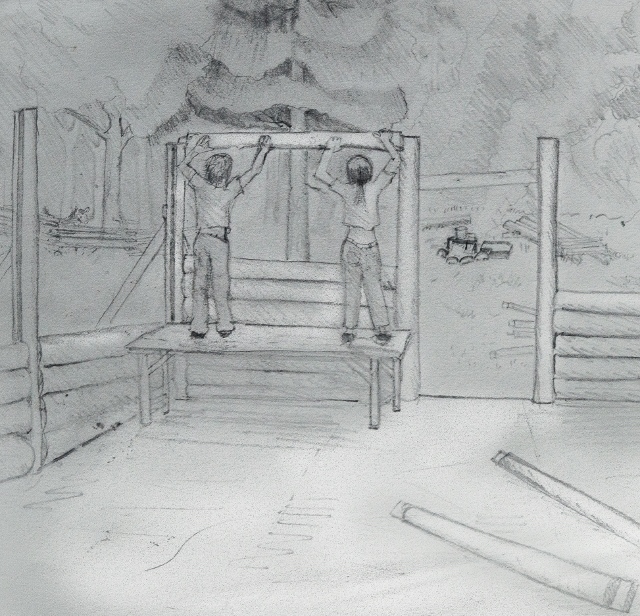 With Joan's, the girls simply stacked them into a wall and the later dad ran his chainsaw down the gap between each log to get a tighter fit. Later they would use some mortar to chink them some more and make the cabin weather proof. So the work for the girls involved skinning the logs once Little Guy had dragged them to the building site, cutting them to fit between the posts and making tenons on the ends. When Patti was away at the riding stables, Joan could do all this by herself. Together, they could then lift them into position. What might seem like an impossible task for the girls could be broken down into manageable parts. slid down the slots in the upright posts. Notice the temporary bracing that holds the posts vertical. Then the roof and wall top beams were raised and the rafters and roofing nailed into place. 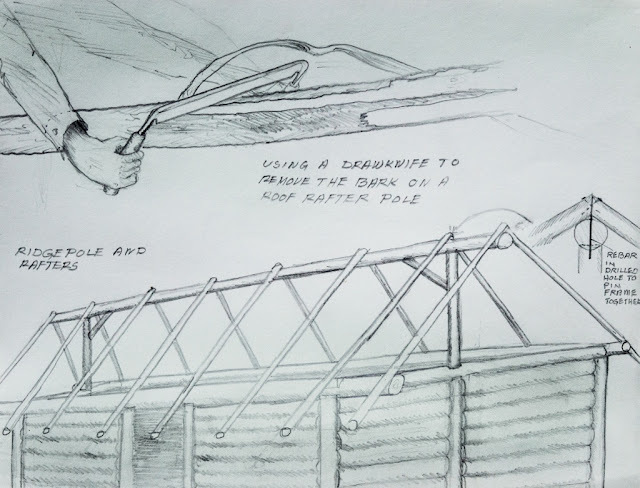 Dad had some old pieces of galvanized metal roofing that would do the job even if they look a little rough on top of the beautiful newly skinned logs. The basic frame was up, but of course for any builder that is really just the beginning - all the picky work of finishing still lies ahead! 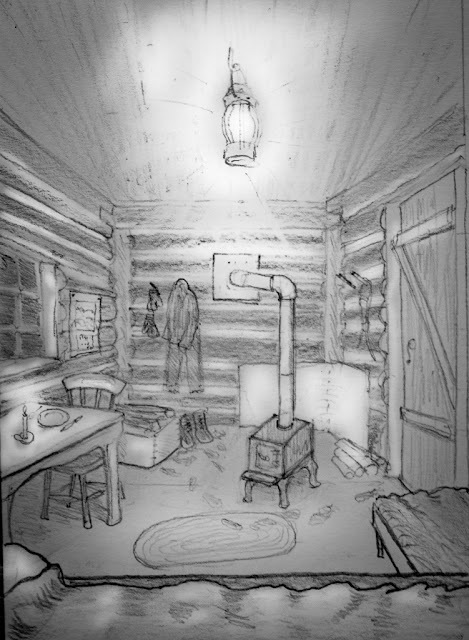 For this simple cabin however, there would be no electricity or plumbing, just the most basic furnishings, a ceiling and a woodstove. Once Joan left for the city, between Jamie and Dad all that could be finished before the snow flew! Once the walls are completed the roof frame is built. and then the rafters are raised and pined and nailed in place. For Joan though, she had already built a visible HOME and had done much of this by herself. A real accomplishment in the midst of her troubled times. And she will be back! the ceiling and furniture, the stove, window and door will be ready.